We have a problem with Stuff. With just 5 percent of the world's population, were consuming 30 percent of the world's resources and creating 30 percent of the worlds waste. If everyone consumed at U.S. rates, we would need three to five planets! This alarming fact drove Annie Leonard to create the Internet film sensation The Story of Stuff, which has been viewed over 10 million times by people around the world. 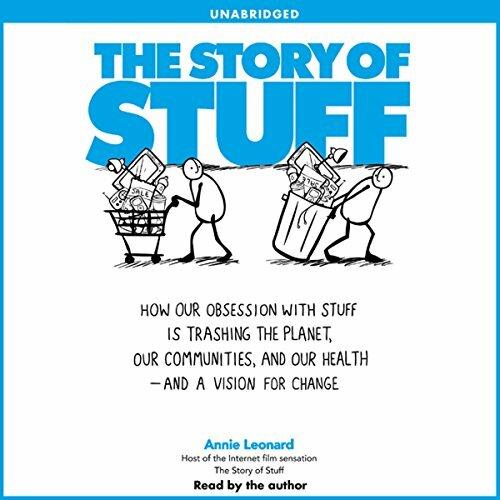 In her sweeping, groundbreaking book of the same name, Leonard tracks the life of the Stuff we use every day where our cotton T-shirts, laptop computers, and aluminum cans come from, how they are produced, distributed, and consumed, and where they go when we throw them out. Like Rachel Carson's Silent Spring, The Story of Stuffis a landmark book that will change the way people think and the way they live. Leonard's message is startlingly clear: we have too much Stuff, and too much of it is toxic. Outlining the five stages of our consumption-driven economy from extraction through production, distribution, consumption, and disposal, she vividly illuminates its frightening repercussions. Visiting garbage dumps and factories around the world, Leonard reveals the true story behind our possessions why it's cheaper to replace a broken TV than to fix it; how the promotion of "perceived obsolescence" encourages us to toss out everything from shoes to cell phones while they're still in perfect shape; and how factory workers in Haiti, mine workers in Congo, and everyone who lives and works within this system pay for our cheap goods with their health, safety, and quality of life. Meanwhile we, as consumers, are compromising our health and well-being, whether it's through neurotoxins in our pillows or lead leaching into our kids food from their lunch boxes and all this Stuff isn't even making us happier! I had to read this book for my Eng 101 class, with six papers to write and only three weeks to read this book i didn't have the time (or energy), so when i found this site with this audio-book i jumped at the chance. A wonderful eye opening book everyone should read! Annie Leonard does a wonderful job of laying out the truth of many environmental and social issues and how they are all tied together. She does a wonderful job of laying out facts without loading them down with technical jargon and without a the major guilt trip. It has motivated me to make significant changes in my lifestyle and to encourage friends and family to do the same, for themselves and the planet! "I really wanted to like this audiobook, but unfortunately the author/narrator made it impossible. Ms. Leonard is clearly passionate about the topic, and the information is quite interesting, but her delivery is just "off", and hence made it impossible to complete. I'm sad to say that I'm going to stop listening to it halfway through"
In my case I also felt that the sample misleads one to believe the book would be similar to Jame Burke's "Connections" - a fascinating history of the sometimes odd links that lead to the things we see and use today. It might be fascinating if you love listening to a bunch of statistics, but I don't. A pity because her topic is vitally important for our future. I read the previous reviews and thought to myself "surely there is enough good information in this book to outweigh whatever narration issues there might be." And I was wrong. I am happy that the author is passionate about her subject but her overemphasis of every other word makes her sound like a cheerleader on speed, and distracts from her message in a significant way. It's like trying to listen to a book written in CAPSLOCK. Perhaps I will read the book in physical form, because I had to stop listening to the audiobook about halfway through. Heed the reviewers and don't get this as an audiobook. just a litany of facts about how badly our current economic system is treating people at the low end and harming our planet. no story to tie it together so it doesn't make for a good listen. A lot of information...but good information. I think this book has a lot of potential... however, its a A LOT of information. The narrator is fine to listen to, and she pulls from her own experience and stories just fine, and has a lot of statistics. In the beginning chapter its hard to stay tuned. Its a book I think you need to be 'in the mood for'. But I would would recommend since I think its important information. The Story of Stuff is so well researched and the information is terrifying to be quite honest. This is filled with statistics and information on the exact way ingredients are mined, processed, distributed, sold, used, and then discarded. From something as simple as a t-shirt to something as complex as a computer. It offers some solutions that everyone can use to lower their impact on the Earth through consumerism and intentional living. The statistics in here are a few years old now, but the info is still incredibly alarming as most of the problems talked about in here have only grown since it's publication. It's narrated by the author who does a great job and is just something I always enjoy while listening to non-fiction. I have not read something that has had such a huge impact on me and my life style for a while, this is something I now recommend to everyone with any questions about how to live a more low impact lifestyle. A must-read for anyone who buys things. And don't we all buy things :). Leonard gives an excellent and easy to understand background on the way our current economy of stuff works and solutions to change it to a better model. Side note, definitely listen if the zero-waste movement in something you have ever been interested in. It isn't the main point of the book, but she has some excellent resources in it. Annie Leonard has done extensive research on the impact of our consumerist lifestyles in North America in particular. At the same time she has made a sincere attempt to make the content accessible to all, on a topic that should be of concern to everyone on the planet, but in particular those of us who by our everyday choices can reduce our disproportionate impact on the planet for current and future generations. I will buy this book for any of my friends or family who would be willing to listen to it or read it. I wish it were required reading in schools.